Well it is official, I am done with 4E. I got together all of my 4E books today boxed them up and sent them off and away to Noble Knight Games for credit. The only thing I kept from my 4E collection was Goodman Games Dragora's Dungeon. I like the module and will probably convert it to Pathfinder at some point. I've always made it a point to hang on to modules and adventures whatever the system is that I'm playing. My last 3.5 Campaign was spent playing the heck out of some old classic Gygax Basic D&D and AD&D modules. Good stuff. I've been surprised at the number of "young folks" that have never played in some of those old adventures. Hmmm now I wonder what I'll do with my credit?....Tome of Secrets looks interesting. Here is the current party make-up of our Pathfinder Campaign. Mind you not everyone has been able to come regularly but at this point no one has officially dropped out. When I get a new camera I'll post pictures of everyones miniature. After last session I'm sure several will have leveled up, but x.p. hasn't been given out yet. In spite of everyone's busy schedules we squeezed in a session of our Pathfinder Campaign this past Sunday. I've been swamped at work, so my Co-DM buddy Clint took up the DMing reigns for me. I got to play Black Wolf my barbarian character (I showed the mini for him a few posts ago). I had left my tribe on a Spirit Quest to find and slay the Ghost Panther, I knew it was close but could not find its lair. The rest of the party was on a mission seeking out some mysterious ruins that the high priestess of The Shrine of the Oracle thought might be the lair/hideout of the recent Shadow Goblin excursions. While en route the party spotted a fire off the trail in the woods, and after checking it out found a red-robed wizard being tortured by a band of well-disciplined humanoid soldiers. Black Wolf came upon this at the same time and joined the battle against the humanoids. After a particularly tough fight ( I almost bought it in the first round of combat) we defeated the humanoids. They all carried themselves with a level of discpline and organization that didn't fit their usual racial types. One, a particularly large goblin that we sought to capture and interrogate swallowed lethal poison rather than let us learn of his master. The wizard we saved, Moonglow, proved to be more than a bit nuts. While grateful to us for rescuing him, he spoke in strange riddles. I told all of my quest to find the ghost panther, he offered to tell me of a secret valley where the beast hunted/laired in exhange for me doing a favor for him, he also indicated this same valley was the location of the ruins the party sought, though in his riddle speaking way we determined the ruin was veiled by magic and hard to find. It seemed the wizard Kilgharn that the group (minus Black Wolf) had recently slain in Farmington (last session) had a tower nearby. Kilgharn and Moonglow were rivals, and while Moonglow was quite pleased we had slain his nemesis he seemed to believe that Kilgharn had the means to restore himself and he wouldn't be happy with us or anyone else upon his return! We were to go to Kilgharn's tower recover a special key for Moonglow and destroy the device in his tower that would allow him to restore himself (Black Wolf didn't quite understand that last part, he was no shaman or medicine man). When the key was returned to Moonglow he would tell us how to get to the hidden ruins. I just realized I never really did much of a write up of session one. *Doh*. Well better late than never I suppose. Our group had come together to seek out adventure and make a name for themselves in the Land of Mordavia (each character has his own reasons for being out and about, which may be revealed in time). While travelling south along the Trader's Road our band came upon a farmhand near death at the side of the road. After the clerics healed him, under the watchful eyes of Howston (ever alert for an ambush), they learned that he was from a nearby farm that had been attacked during the night a day or so ago. The poor farmer had barely escaped with his life, he had just made his way out of the woods was exhausted and terrified. He begged the party to save his friends at the farm. Without hesitation the group set out to lend whatever aid they could! Arriving just at dusk, they could see the buildings that marked the farmsite just past some low hills. Tiberius crept around the back side of the farm. All was quiet... too quiet. Howston not having the stomach for such sneakiness made his way up the main road to the farm. Narlyotep crept along behind Howston, his face hidden behind a mask. Alkanash also made his way ever vigilant for an attack. Tiberious soon jumped a goblin like creature from out of the shadows, though this goblin moved with a sneakiness and stealth that matched Tiberious' own skill. Combat ensued between the two, the rest of the party oblivious to their comrade's danger, pressed onward into the farm. Howston, sensed evil all around them, Narlyotep and Alkanash immediately into action, they popped off some spells; enlarging Howston and enchanting his weapon! Then the shadow goblins attack! They came pouring out of the shadows, firing arrows, sneak attacking! Were it not for the spells and teamwork of the party the outcome could have been disastrous! Tiberious defeated the goblin he had encountered and joined the bigger fight. Howston mowed down the shadowy goblins left and right. Several of them fired arrows from the shadows. All of the party members soon found themselves bleeding and injured but pressed on. Alkanash, spotted an elf tied to a nearby tree behind a storehouse. He freed the elf (who introduced himself as Zebulon) Zebulon paused long enough to cast healing upon himself and Alkanash then they both continued fighting off the goblins. Narlyotep apparently decided that setting fire to one of the farmhouses was a good idea and did so. Soon one farmhouse and a nearby tree were in flames. Unfortunately a farmhand was hiding in the house and ran out engulfed in flames and died. The other party members busy with the goblins didn't realize exactly what had happened and assumed the fire had somehow started accidentally due to all the combat. Meanwhile, Rouge Le Humane; another traveller along Trader's Road, heard the sounds of fighting and saw the fires coming from the farm and set out to investigate. He arrived just in time to help fight off another wave of the goblins. In the farms kitchen house they found several terrified farm hands, Howston wanted to tend to them but both he and Alkanash had spotted several of the goblins headed to a nearby large crevasse/pit covered in timbers. They were dragging a human girl and were clearly going to hurl her into the pit. Howston instructed Narlyotep to tend to the farmers and rushed to aid the girl. Alkanash dropped one of the goblins but another knocked him down and managed to drop the girl into the pit. Her screams echoed about the farm and then suddenly stopped! Narlyotep entered the door way to the kitchen and took off his mask showing his face to the farmers inside. They let out gasps, many wet themselves. He then shut the door and proceeded over to the pit. Howston wanted to know what was in the pit, he could see tons of webs filling it, a torch was dropped and with a soft plop the crevasse below was somewhat visible. The sight chilled them all. The entire covered crevasse was filled with spiders, big spiders! Too big to crawl through the wooden grating covering the crevasse. This was no normal farm, this was a Spider Farm! They harvested the webbing and made it into silk to trade/sell. And a young girl was somewhere down below!!! A Golem we will go! Here's another recent Ebay acquisition. 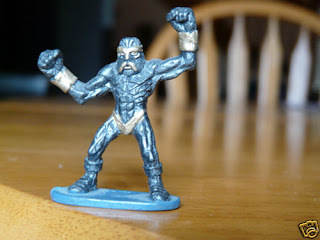 It is an old Grenadier golem miniature. I don't know who painted it. I'm quite satisfied with the paint quality except for the base, which under normal room lighting has a blue effect to it. Which is not at all consistent with my other minis. I'll probably just flock the base or somesuch. Anyways I had never seen this miniature before and quite liked its look so i picked it up. The paint job looks better in person that the picture show. I've got a few ideas percolating on where to us this guy in our Mordavia campaign. Until I get a new camera, here is a little something new. 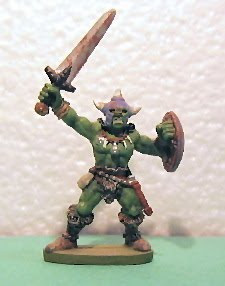 This is an old Grenadier barbarian miniature painted as a half-orc that I recently acquired off of Ebay, I don't know who painted it, but I'm satisfied with it for my purposes. This will be a certain NPC in my Mordavia Campaign. Can't say much else just yet, one never knows when those pesky players are watching er... I mean reading. Well I think I've found the mini for my own character for our Pathfinder Campaign. My Co-DM Clint will be taking over the reins of DMing our Pathfinder Campaign soon, which means I will get to play! Whoo hoo! Course I need a character in order to play. While taking a break during our Pathfinder game at the FLGS today I spied a pack of Heroscape goodies I hadn't seen before. I don't have a lot of Heroscape figures but I'm pleased with the ones I own. The zombie pack in particular have come in quite handy. And as you can see below are quite cool! Clint plays the rogue Tiberious, so when he Dm's this will make us short a rogue, but I think the added muscle of me playing a warrior type will more than make up for it. I'm still working up my character concept, but the miniature definately helps. I will probably start out as a Barbarian and then take some levels in Ranger...or vice versa. Decisions..decisions. I adapted an old Dungeon sidetrek adventure. An evil wizard; Kielgharn had feebleminded a centaur and forced him to become the beast of burden for his wagon. The party came up on this bizarre and distrubing sight, just as Kielgharn was trying to pass through the small village of Farmington. The locals (inspired by an elf who knew the centaur) were yelling at the evil wizard, demanding he free the Centaur. Kielgharn in turn whipped the centaur, forcing him to continue hauling the small wagon. He had a deadline, and nothing else mattered. Things got interesting at this point. Alkanash the gnome cleric of Thoth tried using diplomacy to convince the wizard to stop, no dice, Zebulon the half-elf cleric realized the wizard could really harm alot of innocent folks, so he started quickly moving the villagers away, Howston Levee the paladin, readied himself just outside of town for the battle soon to come. The wagon got outside of the village, with Alkanash not far behind and Howston stepped out demanding the centaur be freed, then things got nasty. Kielgharn then laughing evilly summoned a fiendish ape and unleashed it on the hapless villagers! Villagers ran screaming in all directions! Zebulon raced to the ape, getting its attention, taunting it (quite successfully). Howston attacked the wagon wheel trying to cripple the vehicle, but the wizard managed to escape with the wagon intact. Zebulon knowing the ape would soon rend him limb from limb ran for all he was worth (towards the paladin and the wagon), the ape raced after him, Zebulon could feel the beast's hot breath on the back of his neck! As soon as the beast passed Howston, the paladin struck smiting the evil beast for all he was worth! Meanwhile Alkanash had jumped on the back of the wagon (Acrobatics anyone?) and was soon locked in combat with the wizard on a runaway speeding wagon pulled by a feebleminded Centaur! The ape tore into Howston, his armor saved his life, and Zebulon standing behind him with healing magics didn't hurt. Quicker than I would have thought the noble paladin had felled the beast. The villagers cheered, but what of the wizard? What of Alkanash? A battle of wills and spells was taking place on the wagon. Alkanash resisted fear, was splashed by acid, missed by a whip, he in turn was nickel and diming the wizard here and there. Then it happened the wizard struck down the brave cleric with blindness! But even that didn't stop the cleric he continued fighting the wizard even while blind! Meanwhile with the wizard no longer beating him the centaur stopped. This allowed Howston and Zebulon to catch up to the wagon. They found not a dead gnome companion, but a wizard on the ropes, now ready to parlay. For Howston seeing the poor nearly dead centaur meant no parlay, only swift justice at his sword!! The villagers rejoiced, not a single villager had been hurt! The party were treated like the heroes they were, rested up for the night (Zebulon didn't sleep alone), and headed out the next day for the Shrine of the Oracle, they still had those special silks to deliver there from the Spider Farm and Alkanash needed his sight restored + they had a centaur to get unfeebleminded! The gaming didn't end there...the shrine was found, a Troll Bridge successfully crossed, Zebulon managed not to get killed for eyeing the priestess in the sacred baths, vision was restored, deals were made, party set out again, a Dire Boar was bribed, and stirges were fought...*whew* a busy day! Here's the cover of the soon to be released Sci-Fi Skirmish miniatures game; AE-Bounty. I've been keeping my eyes on this one, it looks pretty cool. Darkson Designs is the company releasing it. They have a retro looking line of minis releasing with it, but you can also use your own minis. It is mainly built for using 28mm minis, but I'm hoping it can scale with 15mm also. Tommorrow we've got session three of our Pathfinder Campaign, having alot of fun with that, but I'm always keeping my eyes & ears open for other games. I've been hearing alot of great things about Savage Worlds lately. I've got the Explorer's Edition, and Slipstream but have not gotten to play it yet. I heard some good stuff about Legends of Steel, a Sword & Sorcery Conanish setting that has a Savage Worlds version, so of course I got a copy. I'm still reading it but I'm liking it. It is higher powered than regular Savage Worlds; characters start out as Seasoned, and some of the Edges are pretty powerful, but it fits the genre nicely. I'll keep you posted.